LORETTO — A two-decade-long journey by a Loretto couple and the Catholic Diocese of Altoona-Johnstown with the goal of having the Rev. Demetrius Gallitzin canonized is coming to an end. All that is left to do, according to Frank and Betty Seymour, is to wait and pray. “It’s the end. This is the official closing,” Frank Seymour said. The Seymours are diocesan postulators of the cause, the lay individuals who have worked for years assembling the materials needed to have Gallitzin elevated from his current level of Servant of God to sainthood. A Mass will be held Wednesday at the Basilica of St. Michael the Archangel in Loretto, which will serve as the closing session of the diocese’s effort to convince church leaders in Rome that Gallitzin was more than the man who brought Catholicism to the region. Part of the Mass will include the wax sealing of the box holding documents gathered by the Seymours and others. Gallitzin, known as the Apostle of the Alleghenies, was a Russian aristocrat born at The Hague in 1770 to the Russian ambassador to the Netherlands. Said to have been cradled in the arms of Catherine the Great, Gallitzin was raised in the Russian Orthodox Church and at the age of 17 was received into the Catholic Church. He emigrated to America in 1792 and arrived in Baltimore, where he entered the priesthood and was ordained in 1795. He was one of the first Catholic priests to be ordained in America. 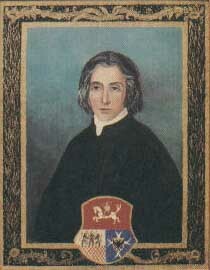 As a missionary, he founded the settlement of what is now Loretto in 1799 on land bequeathed by Capt. Michael McGuire, believed to be the first white settler in what is now northern Cambria County. Gallitzin is praised for his work to build up the Catholic Church in western Pennsylvania and is believed to be Pennsylvania’s first English-speaking priest. Gallitzin died at the age of 69 in 1840 and was buried in Loretto. The Seymours began their Gallitzin journey to sainthood in the late 1980s after becoming familiar with his works and writings. In 2005, the Vatican announced that Gallitzin had been named a Servant of God by the Congregation for the Causes of Saints, the first step toward sainthood. March 2007 marked the opening session of what’s formally called the Diocesan Inquiry for the Cause of Canonization. The Seymours already had spent years scouring local historical documents and searching for everything written by and about Gallitzin. In early 2011, they sent to the Vatican thousands of documents completing the inquiry phase proving Gallitzin lived a virtue-filled life. Stepping up one more rung of what is referred to as the ladder toward canonization, with Betty as the diocesan postulator and Frank assistant postulator, the couple then embarked on this final phase, assembling all of the materials collected to date. The Seymours have worked closely with Father John D. Byrnes, judicial vicar, and in recent weeks had the help of Father Luis Escalante, the postulator working in Rome toward Gallitzin’s canonization. This phase included gathering and copying every letter available that Gallitzin wrote, every tract he authored – all of his writings, Betty Seymour said. Despite four fires at St. Francis University, where much of Gallitzin’s work was held, and word of a trunk of his writings lost in Germany in 1873, the amount of information is staggering. The papers, measured by the foot, will be packed up and sent to Rome, where Escalante will get to work. The validity of the efforts by the Seymours and others from the diocese will be evaluated by the Congregation of the Causes of Saints. A number of other steps remain following the evaluation, and the Seymours are prepared to wait for what they believe will be years. The Seymours know they’ve done their work. Whether or not that opinion is shared by those in Rome is the big question. “He’s a Servant of God. We’re working on venerable. That’s a good possibility,” Frank Seymour said. “Blessed,” is the next rung on the ladder, one that requires a miracle followed by a second miracle opening the door to canonization. There are no guarantees and the timetable is uncertain, said Tony DeGol, secretary for communications for the diocese. “But this milestone has raised a real sense of excitement that our beloved prince-priest Demetrius Gallitzin may someday be truly recognized as a saint,” DeGol said. The originals of Gallitzin’s letters and documents are being retained by the diocese with copies forwarded to the Vatican, the Seymours said. Kathy Mellott is a reporter for The Tribune-Democrat. Follow her on Twitter at twitter.com/kathymellotttd. What: Mass marking closing of diocese information to have Demetrius Gallitzin elevated to saint. The Rev. Mark Bartchak, bishop, presiding. Where: Basilica of St. Michael the Archangel, Loretto.